Able Community Kitchen meets every month. Some say once a month isn’t enough! A rag-tag bunch of folks get together here and make a delicious dinner together, with community volunteers joining forces with some of the residents here. It gets a bit crowded in the kitchen with everyone in action, often with four cutting boards going at a time. Part of the fun is sampling the aromas – from simply smelling a fresh basil leaf to taking in the sizzling onions and garlic. The regular meals here are served on trays, hospital style. You make menu choices at least a week in advance. And no 2nd helpings of the dish you really liked! October’s meal was amazing by all accounts. And it was a vegetable stew! The recipe was called “Three Sisters Stew” after the three foods that Native Americans long ago realized will all thrive when planted together: maize (corn), beans, and squash. Beans climb the maize stalks and squash grows on the ground protecting the roots and base of the maize and bean plants. Among beans, there are so many kinds to choose from – various kinds of fresh green, purple or yellow beans and the dried beans like kidney, navy, pinto, etc. 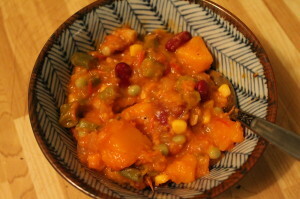 The trick to the deliciousness of this particular stew is that most of the ingredients were harvested just outside, in the Pearson Community Gardens. These gardens were created as part of Farmers on 57th and are tended by GPC residents and other gardeners. With its southern exposure, plants grow very well there. Organic gardening is practiced. And ah! the flavour of those ripe red tomatoes! Some of these tomatoes were frozen whole, soon after picking, destined for this stew. Below is approximately the recipe we made. We used what harvest we had, in what proportions we had, so it’s not exact. But stews are very forgiving! 2 mid sized butternut squashes, halved and roasted 375 til just tender. Saute onions in oil, add garlic and jalapeno and cook til onion is soft. Add the rest of the ingredients and simmer til ready. We served it with mashed potatoes, but you could serve over rice, with biscuits, anything good. Enjoy! This entry was posted in community, Community Kitchen, Garden, wheelchairs and tagged accessible, wheelchair accessible garden. Bookmark the permalink.